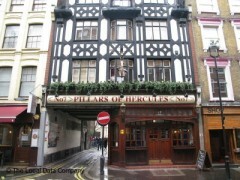 About: Pillars Of Hercules is a small traditional pub serving food all day, as well as a selection of beers, wines and spirits. They have a seating area on the pavement, as well as background music and a fruit machine. Catering for private parties of up to 200 guests is available upon request. Pavement seating is also provided.